HORACE GREELEY. Autograph Letter Signed in full and with initials, to Ephraim George Squier [ed. of Hartford Whig Daily Journal], New York, March 26, 1844. 1 p.
I write to you as most likely to be at home; if Mr. Trumbull or Mr. Stuart were sure to be in Hartford I would write to them. My business is general and important. I have just received a Letter from Cassius M. Clay which is calculated to excite a powerful influence on your Election. You will all publish it of course, but that is not all. You must have it published instantly in all your Religious and the Abolition journals. Do not stand for expense but have it published in the Orthodox journals and the Chr. Freemen, with my heading if possible. Be energetic - be wise. See our efficient friends instantly, and take care that every Abolitionist reads this letter this week. P.S. I shall speak in New Milford on Thursday afternoon, in Danbury that evening, and in New Haven Friday evening. If I had any way to be home Sunday morning, I would speak in your place Saturday evening, but that must be given up. I have a sick wife, a young baby, a very arduous newspaper duty, and an awful correspondence, and must be here Sunday. 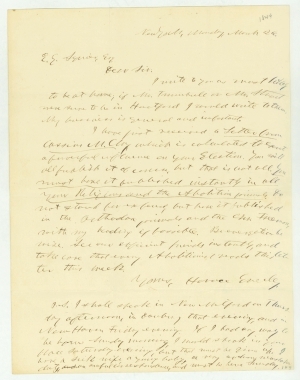 Fearing that abolitionists would not support Whig candidates, Greeley hoped that Clay’s letter would aid in the Connecticut state elections. In that election on April 1, less than a week after Clay wrote this letter, Whig candidate Roger Sherman Baldwin (1793-1863), famous for having defended the African Americans who took over the slave ship Amistad, won 1,000 more votes than the Democratic incumbent Chauncey F. Cleveland. However, because Baldwin did not receive at least 50 percent of the popular vote, the General Assembly had to select the governor. In the General Assembly elections, Whigs won 15 seats in the state senate, compared to 6 for the Democrats. In the House, Whigs initially won 97 seats to the Democrats’ 73, with 35 seats undecided. The General Assembly elected Baldwin as governor, and he took office on May 1, 1844. He was reelected in 1845 with an outright majority of the popular vote. In the fall presidential election, Whig Henry Clay won the state’s electoral votes but lost the general election to Democrat James K. Polk. James G. Birney of the abolitionist Liberty Party received only 3 percent of the popular vote in Connecticut. Horace Greeley (1811-1872) was a noted reformer, New York journalist, and editor of the New York Tribune. His main concern was the abolition of slavery. In 1872, he ran unsuccessfully for president against Ulysses S. Grant on both the Democratic and Liberal Republican tickets. Ephraim G. Squier (1821-1888) was born in Bethlehem, New York, and studied civil engineering. During the Panic of 1837, he turned to journalism, editing papers in New York, Connecticut, and Ohio. At the time of this letter, he was editor of the Whig Daily Journal in Hartford, Connecticut. There, he supported the Whig Party and was a strong supporter of Henry Clay in the 1844 presidential election. After Clay’s loss, Squier moved to Ohio, where he edited the Scioto Gazette, until his election as clerk of the Ohio House of Representatives. While in Ohio, he became interested in archaeology, which would ultimately become the field in which he made his greatest contribution, publishing important works on archaeological sites in Central America, where he also served as the U.S. Chargé d’Affairs. Cassius Clay (1810-1903) was a Kentucky slaveowner who became a prominent abolitionist and newspaper publisher. While a student at Yale University, he heard William Lloyd Garrison speak and the Liberator’s words inspired him to divest himself of his slaves and work towards ending slavery. President Lincoln later appointed Clay as the American ambassador to Russia.